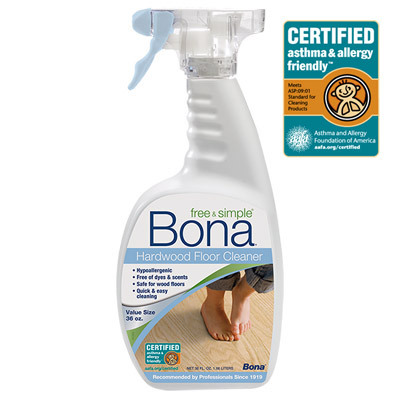 Floor care and the environment goes hand in hand with Bona. Leading the pack, for over 90 Years, Bona sets standards worldwide. That is why here at Clay Floors, we support and recommend all Bona products. Bona brings you innovation, consistent performance and the highest quality the industry has to offer. Keith Clay also shares a concern for health and the environment, and by supporting superior products like Bona, we are assured that it is a proper testament to our dedication. You will see it in the longevity and beauty of your floors. A picture is worth a thousand words, and using Bona quality flooring products, it’s why Bona has been trusted by professionals since 1919. Bona was also the first manufacturer in the industry to offer a complete hardwood floor finishing and care system that is GREENGUARD Gold Certified. The certification assures professionals and consumers unsurpassed durability, beauty and environmental responsibility for hardwood floors from sanding and finishing to floor care. Join the Bonafide Fanatics now for free coupons and more information. Bona waterborne floor cleaners are totally safe for families, floors and the environment. Bona uses the most environmentally friendly raw materials to eliminate harmful effects towards the environment to achieve stringent certifications through third-party organizations, such as GREENGUARD and the Asthma and Allergy Foundation of America. In case you are not familiar with the Asthma and Allergy Foundation of America; AAFA, a not-for-profit organization founded in 1953, is the leading patient organization for people with asthma and allergies, and the oldest asthma and allergy patient group in the world. AAFA provides practical information, community based services and support to people through a network of Regional Chapters, Support Groups and other Local Partners around the U.S. AAFA develops health education, organizes state and national advocacy efforts and funds research to find better treatments and cures. In addition, the mission of AAFA’s Web site is to provide online access to AAFA’s reliable, validated asthma and allergy information and tools to families, patients, parents, healthcare providers, policymakers and others. Click here for more information. Bona’s floor care products are GREENGUARD Gold Certified. GREENGUARD is a non-profit, third party organization that tests indoor products for their environmental impact in an effort to improve the air quality c onsumers breathe.